8021 E. N. Welch 30 hour steeple clock. E. N. Welch 30 hour steeple clock. This is not a very rare clock but it is very original and the condition is quite good. Earlier than most steeple clocks, this one dates to about 1850. The mahogany case has no veneer problems at all and both finial tips are intact. The original finish is rather dark and it would benefit from a slight cleaning. It has the original painted dial and a very good reverse decorated tablet by William Fenn with a patriotic eagle, banner, arrows, stars etc. That tablet has quite minor loss to some of the background color. It has a very good label plus the original pendulum and key. The hands are replacements of the proper style. This is a 30 hour clock with hourly strike on a gong. It is running but the time side click has been repaired and it looks a little weak to me. This rare clock is in nearly untouched condition. 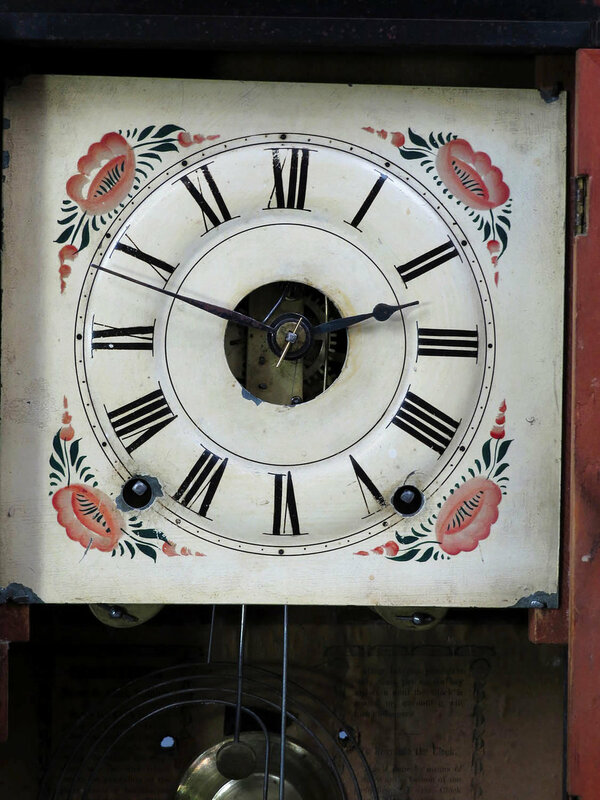 Note that the label states that this clock was made in Plymouth Hollow, Connecticut, not Thomaston, so it dates before 1865. That label is in good condition, quite legible and it is the one showing a team of horses pulling a stagecoach. The case is probably mahogany or rosewood veneers but it is hard to tell because the original finish is quite dark. The painted dial is in excellent condition and has colorful floral corners. It retains the original reverse painted lower glass which has some minor flaking and the upper glass is original. It retains the original hands, pendulum and a nice early key. The only real flaw to the clock is that it has four or five veneer chips on the top and bottom side edges. I tried to show these in the photos and each one is about one square inch. 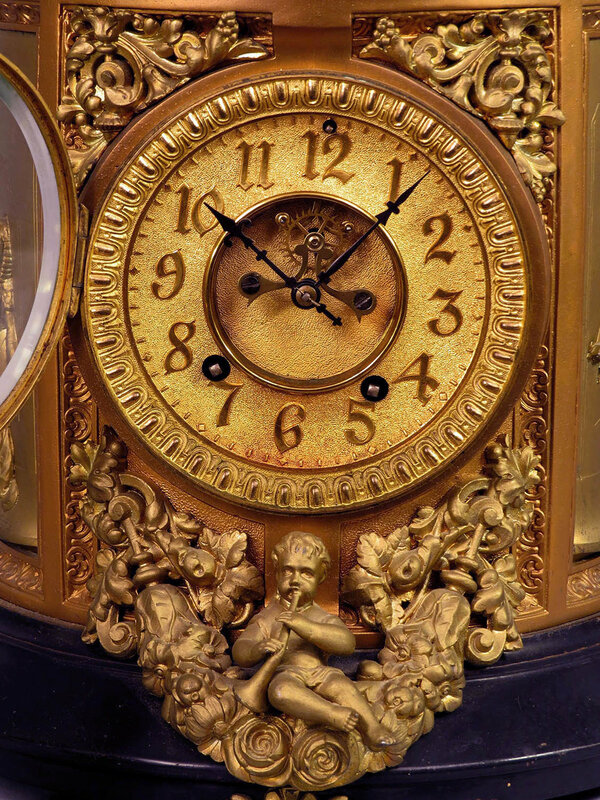 This is an eight day clock with a signed lyre shaped movement. It has been running well for me for several months. 8033 Rare Sperry and Shaw four column shelf clock. 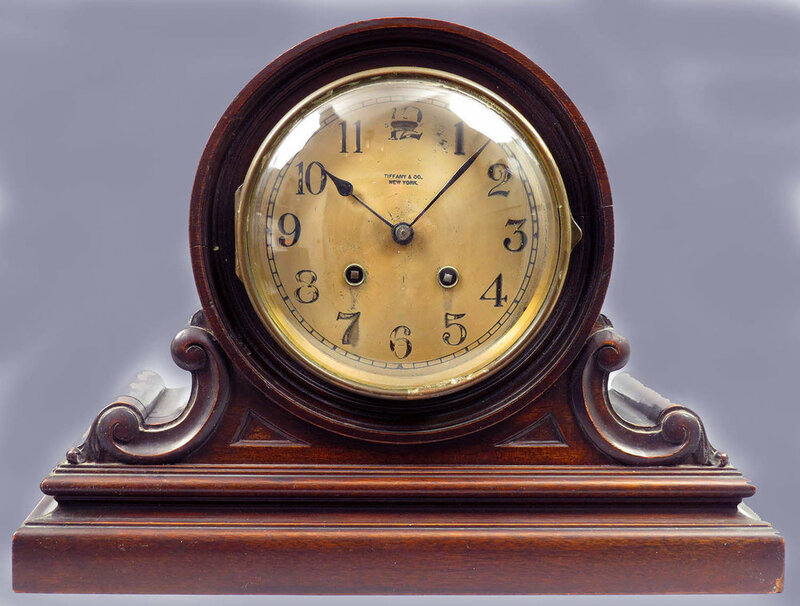 This is a clock worthy of note because it is quite original and is an early style with four freestanding columns. 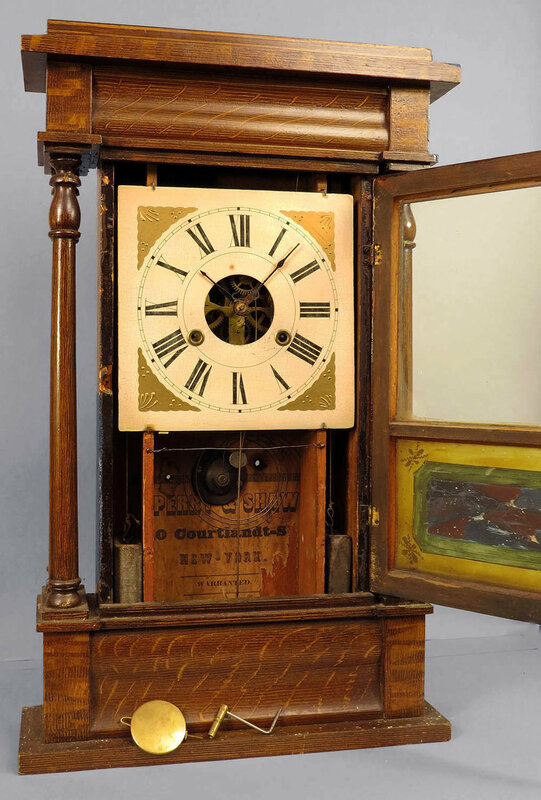 An unusual feature is that the case has the original grain painting done to resemble quarter-sawn oak. There is very little paint loss and very few case blemishes. The painted wood dial is in excellent condition as is the colorful reverse painted glass below. Though the hands look unusual I believe they are the originals. 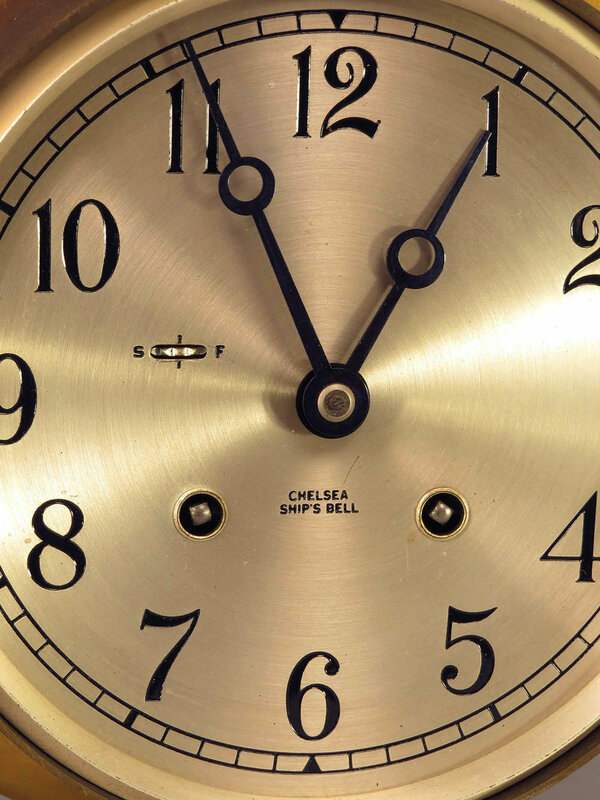 The minute hand appears short because it was broken at the center then reattached. The label is about 80% complete. This is the case style that has those thin wafer shaped weights that run in the narrow channels at the sides. The weights were missing when I found the clock. I have included an old original pair but one is quite tight in the weight channel. This is a weight driven 30 hour clock with hourly strike on a gong. It is running and striking properly though I have not had it running very long. 8044 Ansonia “Indiana” mantle clock. 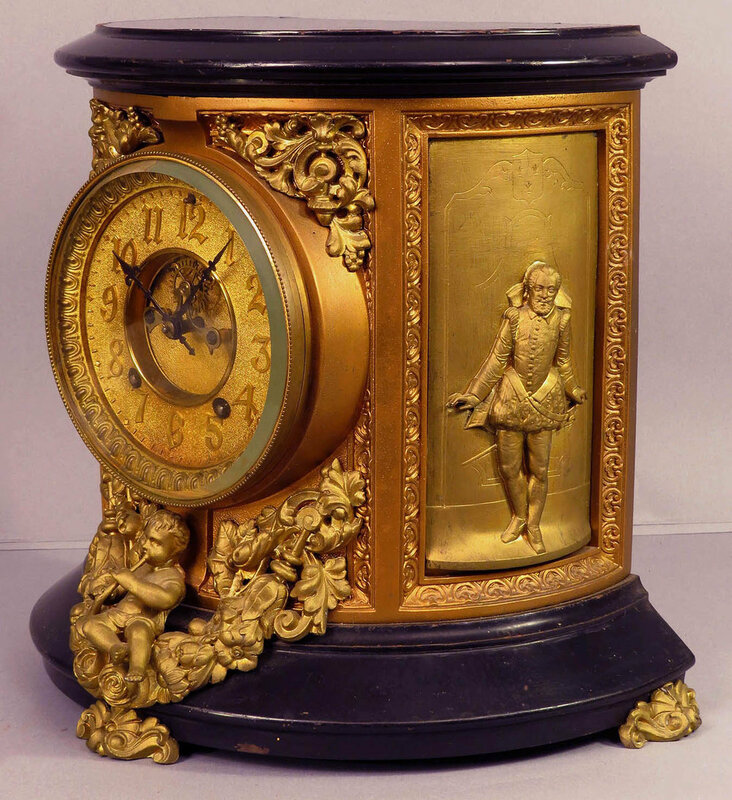 This is one in a series of elaborate black enameled clocks made by Ansonia. The cast-iron case has the original black paint which is in good condition but for the wear on the very top edge. The cast metal trim on the front with the Cupid, plus the curved side panels with figures are done with two tones of gold color. I believe this color is the original but I have not owned one of these for many years so I do not have something to compare it to. I do not see any broken or repaired pieces on any of the applied trim. The two-part metal dial is quite nice with a mat background and gilt polished raised numerals. It has an open escapement, the original hands, a cast brass bezel and a heavy beveled glass. It also retains the original pendulum and key. I am not sure if originally it had any rear cover but now it is just as you see it in the photo. 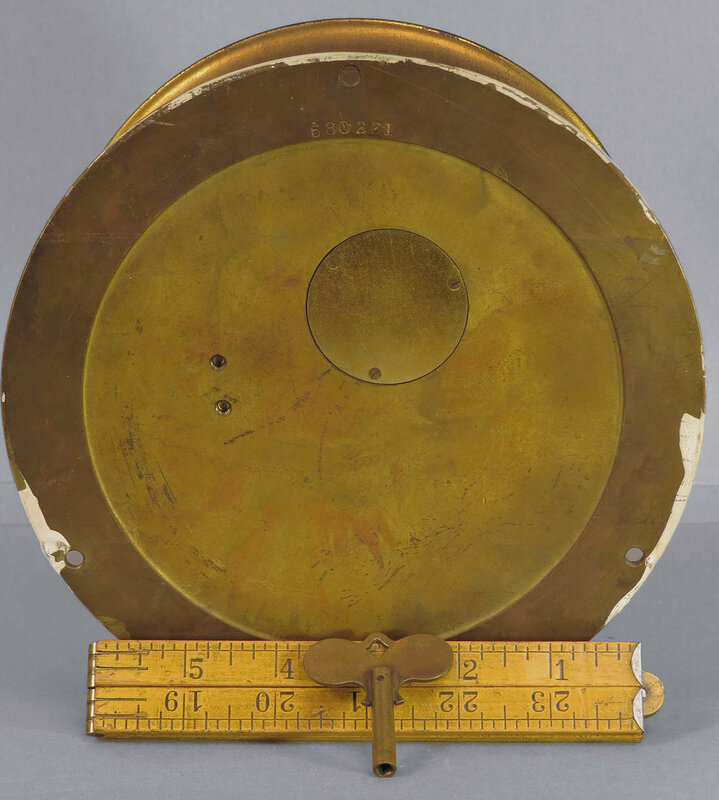 This is an eight day clock with an hour and half hour strike on a gong. It ticks and strikes but stays running only a short time. 8045 Chelsea / Tiffany mahogany mantle clock. This clock has a solid mahogany case which is in very good condition but it would look even better if the case were cleaned. The silvered dial is signed “Tiffany & Co. New York”. There is a little bit of paint loss on some of the numerals. It has a heavy cast brass bezel and a convex beveled glass. The hands are the originals and it has the original Chelsea key. This is an eight-day clock with regular hourly strike on a cathedral gong. It will need a cleaning to be put in running order. The serial number on the case and movement is 112, 744 which dates to about 1918. 8054 Chelsea six inch ship’s bell clock. The overall dial diameter is 6 inches and the overall case diameter is 7 ¾ inches. The solid bronze case is in good condition without any dents or damages from being dropped or mishandled. It has an old, unpolished finish. There is a little white paint on the very back edge where someone was sloppy when they painted a wall and did not move the clock. That paint seems to flake off with a bit of fingernail pressure. It has a hinged bezel. The dial is in great condition with almost no wear or flaws. The hands are original and it retains the original Chelsea key. The case is stamped with the serial number 680,221 which dates to about 1965.